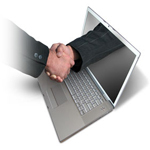 NDMS Consulting provides IT Consultant services across a wide range of IT specialist areas. My particular area of expertise is within small to medium sized service organisations where I am able to supply the skills and resource that traditionally exist within a larger organisations with permanent IT staff but on an ad-hoc or short term basis at a fraction of the cost and with far greater flexibility. With skills and knowledge available from NDMS Consulting ranging from straightforward IT support and assistance through to strategic direction there is little that I cannot provide to a business that wants to advance it’s technological capability but without the costs and headaches typically incurred. If NDMS Consulting is engaged to assist or support your business I am available 24/7 as I recognise the importance of being on hand when your business needs it. There are many more areas that NDMS Consulting can provide assistance with. Contact me for more information or to discuss a particular requirement.